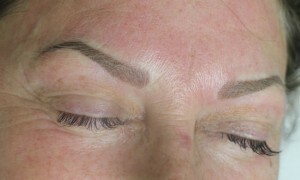 The difference between hair stroke/feathering eyebrow cosmetic tattoo, and the powder fill/solid block method? 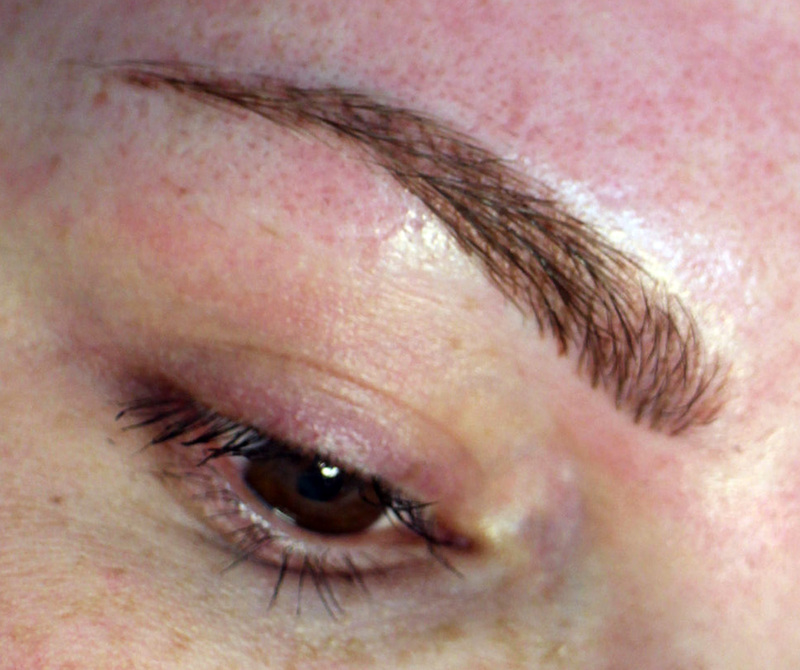 This is probably the question I am most frequently asked in regards to eyebrow cosmetic tattoo – and one which does require some explanation, as in my own opinion, there is no one method which is superior to another – different method of application achieve different looks, and are suitable for different faces. The hair stroke method has become incredibly popular in recent years, I think in some part due to the trend for thick yet bushy and natural looking brows that seem to be on all the catwalks at the moment. The advantages are that it does look very natural, like real hair. It is perfect for people that already have quite good hair coverage, and for those who want to fill out gaps in their eyebrows where hair is missing, because the strokes can be made to mimic the natural hair present in colour, thickness and angle. In younger skin, it can even work very well for creating a complete brow where little to no hair exists. – this is because the action of ‘stroking’ the needle through the skin to create a ‘hair like’ mark does not actually implant the pigment as deeply as the powder fill method. It usually needs to be retouched more frequently than the powder fill method, as it fades more quickly (particular hair stroke brows done in lighter colours). So if for you, the most important factor in your cosmetic tattoo treatment is longevity, I would probably not opt for the hair stroke technique alone. Also, in older skin, or skin that has been aged prematurely from sun exposure, the hair strokes do not stay in the skin as well defined as in younger, more elastic skin. So for mature clients, I would often recommend the powder fill, or hair strokes over an initial powder fill treatment, for a better result. The powder fill method involves the application of thousands of tiny little dots of pigment, inserted into the skin, gradually building up a colour and a defined shape. It is the more traditional method of cosmetic tattoo, and the pigment usually lasts longer when applied in this manner, as it is deeper in the skin. However, many people are fearful of this method looking too ‘solid’ or unnatural, because it does indeed have a more defined, solid look than hair strokes alone. But, what many people don’t realize is it can be made to look very natural looking – by not saturating the desired brow shape 100% with pigment – to allow a defined yet soft/non solid look. A fantastic compromise between the two methods described above, is having an initial powder fill treatment in a slightly lighter pigment that you would like for the final result, followed about 4-6 weeks later by a slightly darker hair stroke application over the top. This, in my opinion, is a great way to achieve a natural hair stroke look, but with better definition and longevity than hair stroke on naked skin. Two treatments (initial, and retouch) are offered in all of my pricing for eyebrow cosmetic tattoo, so it does not actually cost anymore to have these two methods done subsequently to create this look. Anyway, I hope this post sheds some light on the different application methods for cosmetically tattooed eyebrows, and helps you if you trying to make a decision regarding cosmetic tattoo. I am available at Lady Lash every Wednesday, Thursday and Friday for complimentary consultations in cosmetic tattoo, so if you would like to come in and see me to discuss what options might work for you and to see some of my work, please give us a call! October 17, 2014 by charlie | Comments Off on The difference between hair stroke/feathering eyebrow cosmetic tattoo, and the powder fill/solid block method?